Far East Plaza is known as a hang-out for Singapore’s teenage ah lians and ah bengs who flock there for cheap, flashy fashions. Since a meal at this mall usually means KFC and bubble tea, I was sceptical when I heard there was a good Turkish restaurant tucked away inside. Wipe your drool off the screen! I’m happy to report that Anatolia Turkish Restaurant is more than just good – I’m declaring it the best kebab I’ve yet to have in Singapore. 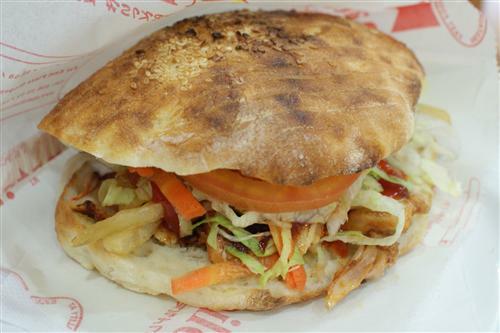 While the kebabs from the late-night joints at Clarke Quay may be satisfying after a few rounds at the riverside bars, the pita bread falls flat. Maybe it’s to suit local tastes, but most kebabs I’ve tried in Singapore are served on the unleavened equivalent of WonderBread. And it doesn’t help that they're doused in mayonnaise and chilli sauce. At Anatolia Turkish Restaurant the bread was clearly made especially for their donair kebabs, not some multipurpose wraps sourced from the supermarket. A ‘donair pancake’ with the super-thin pita all too common also makes an appearance on their menu, but actually costs more. As good as it gets without hopping a plane to Istanbul. Considering they have a sit-down dining area, prices are very reasonable and I paid S$10 for a set meal with a kebab, fries, and a drink. The price you see on the menu is the price you actually pay – there’s no additional service charge or GST. While I’d pass on the fries on my next visit, I’ll be back for another kebab and to sample something from their menu of home-style Turkish cuisine. The menu covers everything from kofta (meatballs) to guvec (meat and veggies baked in a clay pot) to menemen for breakfast (an omelette-like dish).